A few key considerations for pruning I call the ABC’s — why, when and how. First know why you are pruning. Is the plant too large for the location, does it have dead wood, is it causing a hazard with rubbing branches, or are you doing it to increase fruit set or number of flowers? Not all plants need to be pruned every year. Fruit crops and roses are the exceptions. should be pruned AFTER they bloom. If you prune them in February, you are taking off their flower buds. Most summer-blooming plants bloom on new growth, so they should be pruned prior to new growth beginning. This includes, roses, althea, butterfly bush, abelia and crape myrtle. Some plants in the same family need pruning in different seasons. Two examples are hydrangeas and spirea. The showy pink or blue big leaf hydrangeas and the oakleaf hydrangeas bloom in the summer but on old wood, so should only be pruned after they bloom in the summer. The panicle hydrangeas and the smooth Annabelles bloom on new wood, so prune before growth begins. Bridalwreath spirea blooms in the spring, so prune after bloom, while summer-blooming spirea blooms all summer and should be pruned before it starts growing. Evergreens like hollies, boxwood and eleagnus can handle light pruning any time, but severe pruning — more than one-third of the plant — should be done before hot weather hits. using fit the job and that the blades are sharp and clean. 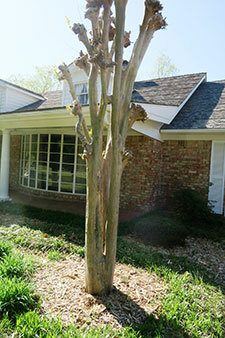 Most shrubs grow either with a main trunk and branches or with multiple stems or canes that arise from the soil. 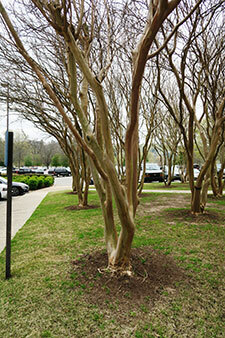 For dominant-trunked plants, selective thinning of branches at various heights leaves a more pleasing shape. To reduce size on cane-producing plants, remove older, woodier stalks at the soil line, and then reduce overall height on what is left. For roses, again it depends on what type of rose you are growing. Hybrid tea roses need the most precise pruning, leaving 3-5 branches and pruning back to an outward-facing bud 8-18 inches from the ground. Shrub roses should be cut back to within 10-24 inches from the ground. Climbing roses should be pruned after the first flush of flowers. A nicely pruned fruit tree. 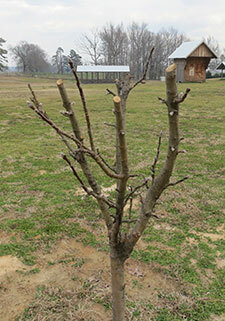 Fruit trees, blueberries and grape vines need annual pruning. Most home gardeners just have a few of these plants, so wait as late as possible into the month to prune. Blueberry canes are not as productive once they get older than 4 years, so prune the older ones at the base. Grape vines are prolific growers and need severe pruning annually to keep them productive. February can be a huge pruning month, but before you grab your pruning shears and start cutting, make sure you know what you are hoping to achieve. Remember, you can always take off more branches, but you can’t glue them back on. If you have questions, contact your local county extension office for more information or visit their website at www.uaex.edu. Janet B. Carson is a freelance writer specializing in gardening.